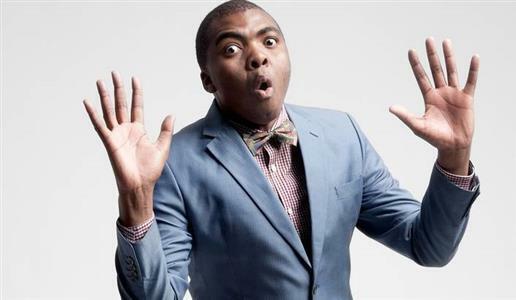 The opening night of the Roxy Winter Comedy Festival featured the Emmy-nominated South African comedian Loyiso Gola, performing Loyiso Gola Live. Being a longtime fan of his Late Nite News show, I expected to witness a hilarious branch of intelligent political satire. To my delight, Gola produced not only this but more. In the scripted part of the show Gola makes use of his personal experiences, bringing in social commentary that leaves you in stitches. We hear about his growing up in the township, his love of particular Afrikaans words, and his opinion on current affairs – an array of topics seemingly random in combination but that makes perfect sense in Gola’s hands. The bulk of his humour touches on race relations and differentiation, but in a non-offensive way that allows the audience to relate and laugh at themselves. He is a master of accents and pronunciation, and if that doesn’t get you laughing, the facial expressions and demonstrations that accompany his punchlines will. Gola’s political undertones and occasional political shame-dropping, provide thought-provoking truths of life and society and allows his intelligence to shine through. Despite the rather empty opening night, Gola had the audience laughing from beginning to end impressing everyone with his witty brand of cynical humour, so much so one begins to wonder where the rest of the crowd was… It would be a shame if this comedic brilliance went unheard.